My father started raising cattle on our family farm in Stanly County, North Carolina in the early 1950s. He had a reputation for raising high quality beef. I happily continue this endeavor today. Burleson Farms’ cattle are guaranteed to be at least fifty percent Angus. Angus cattle are cross bred with European breeds to gain hybrid vigor and efficiency while maintaining the unrivaled tenderness and flavor of Angus beef. 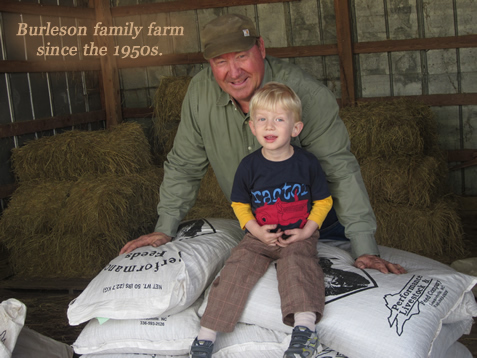 Why Burleson Farms Natural Beef? Burleson Farms cattle thrive on the lush green grasses and hay grown on our family farm. All the beef we sell is homegrown from birth to harvest. Our cattle are well cared for as they grow, free from the growth enhancing antibiotics, added hormones, preservatives and animal by-products commonly used in commercial feed lots. These feed lots add chemicals to feed to enhance digestion and reduce sickness. Drugs are often used to make up for poor management practices. Burleson Farms’ goal is to raise cattle in a natural environment in order to produce a healthy product for our customers to enjoy and feel good about eating. We supplement our cattle with small amounts of grain prior to harvesting to enhance the beef’s marbling and flavor. This creates a more desirable product for customers to enjoy. Our beef is dry aged with a 10 day hang time prior to trimming. Although this is time consuming, we think it is necessary for superior flavor and tenderness.